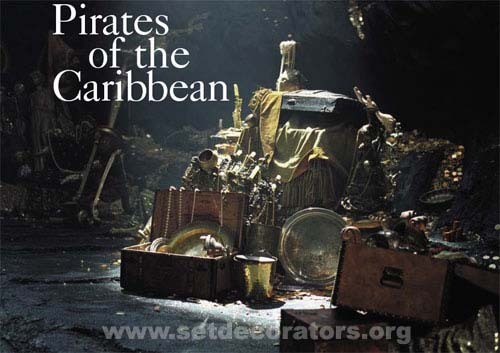 Set Decorator Larry Dias helped turned Disney’s classic amusement ride, PIRATES OF THE CARIBBEAN into a wild and wacky, swashbuckling fantasy movie of the same name. 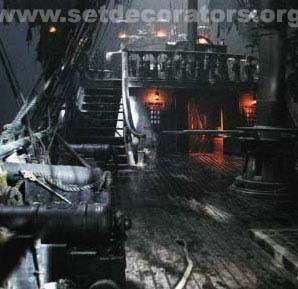 SET DECOR: First, let's get obsessed with PIRATES OF THE CARIBBEAN - is this your first movie based on a Disneyland ride? Larry Dias: Oh my God, yes! SD: Okay, let's be honest, how many times did you have to go on the PIRATES OF THE CARIBBEAN ride before you had a vision for the movie? LD: Physically, only once, but the Art Department went on the ride, filmed it, took still photos with a panoramic camera (stopping the ride whenever they needed to) so we had great research. I think I watched that film about 1200 times. Grenadines. It's sort of an undeveloped island without the really beautiful beaches and white sand. We had to choose an island like this so we could create big plate shots and be in an unidentifiable place. The beaches we did use allowed us to build our big ocean front town, Port Royal, Jamaica. SD: Did being on this island pose any unique decorating challenges for you and your crew? we had to barge everything in. Even going to the set every morning involved going aboard a double-decker barge and sailing in. SD: How did you manage your crew on such a remote location? Visinare SDSA, the lead, the coordinator, and some set dressers. I did hire a few local set dressers and we all worked really hard. My crew was amazing - they made it all possible. one set which generates a moment of abject horror where we think, "How in the world am I going to pull that off?" Did you have a moment like that when you first encountered the PIRATES OF THE CARIBBEAN script and how did you resolve those challenges? the cave and some other materials. of coins and pirate booty. In the end, I had to have almost 1 million gold coins minted. SD: How did you go about doing that? LD: We found original coins from that period - Spanish and Portuguese coins, then we cast them and gold plated them, virtually creating our own mint. SD: What happened to those coins after the movie? LD: They turned out really well. I think they're being used for public relations purposes now. LD: (laughing) No, definitely not. But Johnny was funny with his gold teeth. SD: Did he or any of the other actors respond to the set decor and art direction? LD: Yes, all the actors were terrifically responsive to the environment we created. SD: Besides minting coins, did you have an extraordinary amount of fabrication demanded by the fantasy and period qualities of PIRATES? building the two main ships, the Evil Pirate ship and the British naval ship. 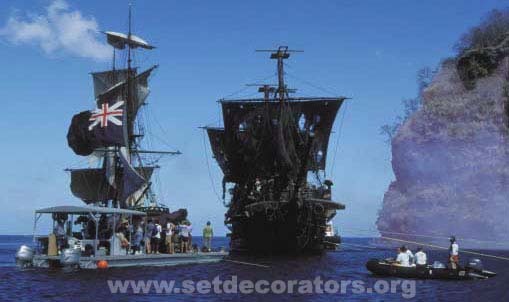 The British ship we actually built twice, once for shooting in San Pedro, then once again in the Caribbean. Both ships were built on top of barges so they looked like real ships but the structure that propelled them was under water. 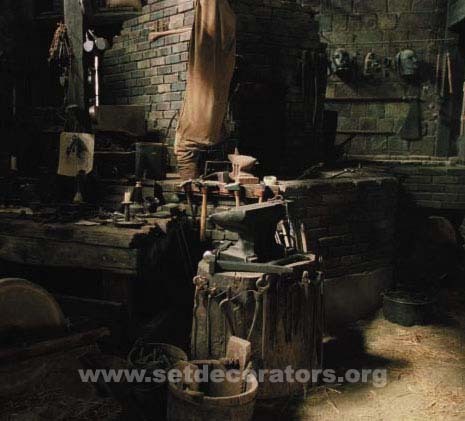 These were such huge undertakings that we set up our own in-house staff shop to enable us to sculpt, make molds, cast, weld and paint - whatever was demanded of us, we could do on site. SD: Besides the fabrication, were there any vendors in Los Angeles who were especially helpful with your execution of PIRATES decor? LD: So many vendors helped me, but especially Warner Bros. Prop House, Universal Prop House and House of Props were terrifically helpful to me with the accumulation of vast amounts of treasure. They were also accommodating with long-term rentals. SD: What sources and methodology did you use for your research? LD: Most of our research came from the Internet. We would look up headings like pirate objects, ship building, ship interiors and that would lead us to interesting eccentric people who were doing things like keeping the original art of blacksmithing alive. The Internet made it possible for us to hook up with collectors and people who published small pamphlets on otherwise lost arts. We also purchased a huge amount of books and studied the images, obviously focusing on the styles of architecture and everyday objects used in the Caribbean islands during that period. SD: Larry, thanks for sharing the secrets of PIRATES OF THE CARIBBEAN with us. As decorators interested in the art of storytelling, I can guarantee that anyone who sees the film will benefit from learning about your wonderfully creative solutions.